How do YOU sabotage your success? Be honest. We all do it. Sometimes we don't try hard enough. Other times we shy away from opportunities. Oftentimes we are just too tired and worn out to make the effort required. In this economy, however, it's more important than ever to get out of sabotaging behavior and make your success a number one priority, because if you don't your competitor will beat you to your next new client. This post is about ways to stop sabotage and follow your dreams. Create a forceful mantra - Sometimes we need a visual or verbal reminder of our potential success. 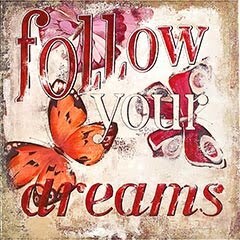 Mine is the three foot by three foot painting in my office that says "Follow Your Dreams." It sits right above my desk. It's the first thing I see in the morning and the last thing I see when I stop work in the evening. I chose to follow my dream of starting an independent coaching practice for financial advisors six years ago. I live, eat, and sleep success. This painting is my mantra. What is your mantra? Jump at opportunities – I am continually amazed at the opportunities many people let go by because they are simply not following up with prospects and clients. You've heard the saying "the early bird gets the worm"? Well it's TRUE. Be on the ball. Be assertive. If an opportunity presents itself, be the first to raise your hand, EVEN if it's scary. Feel the fear and do it anyway. Live up to your full potential – You may have done this in college - You could have gotten an A but you skated by with a B. In the real world, that won't cut it. What could you be doing that you are not doing? Could you be a leader in your field? Do you have a "field" or a niche? Stop being "safe" and declare your niche and your full potential. Stand out from the crowd and take a stand. Your past has nothing to do with your path – We make our own success. The path you have travelled may have been full of detours, ruts, and poor neighborhoods, but you make who you are. You are in charge of your own life and only you can write your success story. Here are some resources to help you move forward. Real change comes from connecting with the motivation and emotion behind the change you want to make. Without going there, you don't stand much of a chance of making change permanent. Work with a coach or a success partner to correct sabotaging habits and make them go away. Then replace them with success traits and follow your dreams. Here’s a little music video I’ve just put together that talks (or rather sings) about choices we make when it comes to pursuing our dreams, and the price we sometimes pay for that. Very nice post. I think you might also list Susan Jeffers book "Feel the Fear and Do It Anyway." That book really takes it down to the basics for reworking negative thinking. Thanks Barro and Karrie. Yes, Susan Jeffer's book is a good one for this post.